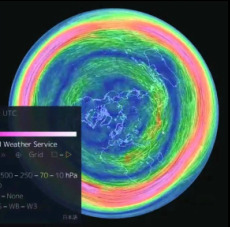 Weather patterns look much more sensible on a Flat Earth map, such as in this photo. Rather than swirling around randomly, as it does on the Globe model, the symmetry of wind and weather appears to be exactly correlated to its location on the Flat AE map. "He scattereth his bright cloud: And it is turned round about by his counsels." In this series, I will attempt to showcase a different Flat Earth Map in each post. I also hope to find out a little background information as to why the map has an association with the Flat Earth.